To this day cities and towns throughout the American west celebrate their mining heritage by hosting competitions that display the historic skills used by hard-rock miners during the 19th and 20th centuries. Starting in the mid-1800’s, the gold rushes of the American West led to the pursuit of precious minerals. Often these resources were found in ore veins locked within the rock. Miners used a variety of tools to extract the valuable ore. Hammers, rock chisels, black powder, shovels and the skills to use them were common place in the early mining camps. 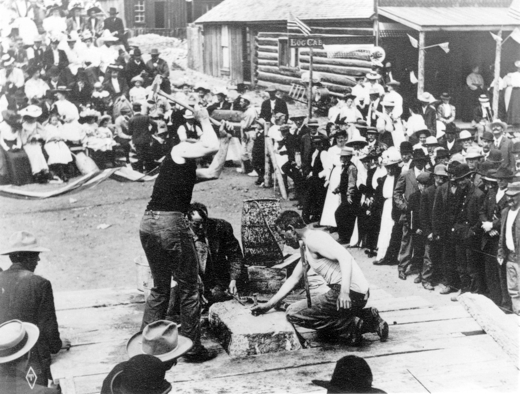 Towns across the West hosted mining contests that pitted the best miners in the area against each other. These contests attracted large crowds, and offered handsome payouts to the men who proved themselves the strongest and most skilled. Today’s contests pit men against the clock and one another as they reenact those activities that miners performed day in and day out. Please enjoy the site and learn about the history, and little-known modern contests of today. Also keep up with the schedule of Miners Day Contests across the west and stop in for a visit. You won’t regret it!